The sale of duck stamps by the U.S. ‘Fish and Wildlife Service (USFWS) to pay the cost of preserving the wetlands was declining. So the USFWS brought in The Ball Group a marketing research and advertising firm based in Lancaster, Pennsylvania, to conduct research to discover who else might be interested in purchasing the stamps and why these groups would want to purchase the stamps – what marketing should take place and what benefits the stamps were perceived as providing. The Ball Group decided to conduct focus groups and a telephone survey to determine the answers to these questions, The Sampling process for the telephone survey was as follows. Duck stamps are available throughout the United States, and all U.S. citizens are affected by the preservation of the wetlands, so the population was defined to include all U.S. citizens. The sampling frame consisted of computer software for randomly and efficiently generating telephone numbers, The sample size, determined by resource constraints and sample size used in similar studies, was 1,000. 1. Target population: Element: Male or female head of household; Sampling unit. Working telephone numbers; Extent: United States; Time: Period of the survey. 5. Execution: Use a computer program to randomly generate a list of household telephone numbers, Select the male or female head of household using the ~ext birthday method. Conduct the interviews using a computer-assisted telephone interviewing (CATI) system. The result of this research showed that people did want to help the effort, but they wanted something to demonstrate their generosity. Therefore, the U.S. Fish and Wildlife Service decided to start marketing the stamps to the American public as a great way to “donate” money to help save the wetlands, For 530 in addition to receiving a stamp, purchasers also receive a certificate saying that they helped to save the wetlands. As of 2009, the duck stamp program was a great success. comScore SurveySite is a full-service research firm based in Ontario, Canada comScore SurveySite’s mission is to provide “leading-edge and innovative Web site evaluation systems and market research to the Internet community.” Its goal is to be the “undisputed leader in quality Web site research and visitor analysis.” Survey Site conducted a survey to determine Canada’s perception of the high-tech industry compared to the United States, Three thousand Canadian IT managers “ere surveyed, and the results revealed that Canadians perceive themselves to have fallen behind in technology compared to the United States. Many respondents noted that Australia was a more realistic country to compare Canada to, instead of the United States. One research program SurveySite offers is the “Pop-Up Survey.” The product counts the number of people that visit a Website and selects visitors at a predetermined interval. For example, every 100thperson to click on a client’s Website is selected based on systematic random sampling. When this happens, a small Java script pops up. The script requests the user to complete a short online survey. If the visitor clicks no, the Java script disappears and the person continues browsing. If the visitor clicks yes, a client-designed survey appears, The advantage to this “pop-up” model is that it significantly increases the user response rate, The typical survey method offers a banner that asks visitors to take the survey, The banners, however, tend to have a very poor response rate, In general, the rate is about 0.02 percent or 1 out of every 500 visitors. The SurveySite “pop-up” dramatically improves the response rate, and it enables data collection to be reduced from weeks to days. As a result, SurveySite’s Internet research strategy has helped the Internet research firm to land corporate clients such as Timex, Delta Hotels, Toronto-Dominion Bank, Kellogg’s, and Canadian Tire.2 This example illustrates the various steps in the sampling design process. However, before we discuss these aspects of sampling in detail, we will address the question of whether the researcher should sample or take a census. 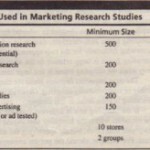 The objective of most marketing research projects is to obtain information about the characteristics or parameters of a population, A population is the aggregate of all the elements that share some common set of characteristics and that comprise the universe for the purposes of the marketing research problem, The population parameters are typically numbers, such as the proportion of consumers who are loyal to a particular brand of toothpaste, Information about population parameters may be obtained by taking a census or a sample, A census involves a complete enumeration of the elements of a population, The population parameters can be calculated directly in a straightforward way after the census is enumerated, A sample. on the other hand, is a subgroup of the population selected for participation in the study, Sample characteristics called statistics, are then used to make inferences about the population parameters. The inferences that link sample characteristics and population parameters are estimation procedures and tests of hypotheses. 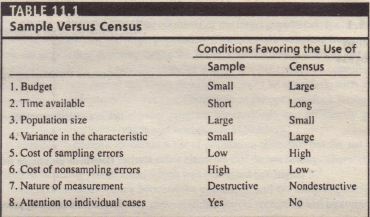 Table 11.1 summarizes the conditions favoring the use of a sample versus a census, Budget and time limits are obvious constraints favoring the use of a sample. A census is both costly and time-consuming to conduct. A census is unrealistic if the population is large. as it is for most consumer products, In the case of many industrial products, however, the population is small. making a census feasible as well as desirable, For example, in investigating the use of certain machine tools by U.S. automobile manufacturers. a census would be preferred to a sample, Another reason for preferring a census in this case is that variance in the characteristic of interest is large, For example, machine tool usage of Ford will vary greatly from the usage. of Honda, Small population sizes as well as high variance in the characteristic to be measured favor a census. If the cost of sampling errors is high (e.g., if the sample omitted a major manufacturer such as Ford. the results could be misleading), a census. which eliminates such errors, is desirable, High costs of nonsampling errors. on the other hand, would favor sampling, A census can greatly increase nonsampling error to the point that these errors exceed the sampling errors of a sample. Nonsampling errors are found to be the major contributor to total error, whereas random sampling errors have been relatively small in magnitude. Hence. in most cases, accuracy considerations would favor a sample over a census. This is one of the reasons that the U.S. Bureau of the Census checks the accuracy of various censuses by conducting sample surveys,” However. it is not always possible to reduce nonsampling error sufficiently to compensate for sampling error, as in the case of a study involving U.S. automobile manufacturers. A sample may be preferred if the measurement process results in the destruction or contamination of the elements sampled, For example product usage tests result in the consumption of the product, Therefore taking a census in a study that requires households to use a new brand of cereal would not be feasible, Sampling may also be necessary to focus attention on individual cases. as in the case of depth interviews, Finally, other pragmatic considerations. such as the need to keep the study secret, may favor a sample over a census. 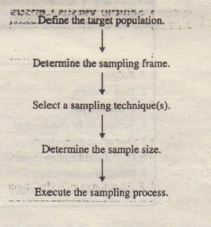 Sampling design begins by specifying the target population, The target population is the collection of elements or objects that possess the information sought by the researcher and about which inferences are to be made, The target population must be defined precisely, Imprecise definition of the target population will result in research that is ineffective at best and misleading at worst. Defining the target population involves translating the problem definition into a precise statement of who should and should not be included in the sample. The target population should be defined in terms of elements, sampling units, extent, and time. An element is the object about which or from which the information is desired. In survey research, the element is usually the respondent. A sampling unit is an element. or a unit containing the element, that is available for selection at some stage of the sampling process. Suppose that Rev Ion wanted to assess consumer response to a new line of lipsticks and wanted to sample females over 18 years of age, It may be possible to sample females over 18 directly, in which case a sampling unit would be the same as an element, Alternatively, the sampling unit might be households. In the latter case, households would be sampled and all females over 18 in each selected household would be interviewed. Here, the sampling unit and the population element are different. Extent refers to the geographical boundaries, and the time factor is the time period under consideration, The opening duck stamps example showed an appropriate definition of a population. We use the department store project to provide another illustration. Defining the target population may not be as easy as it was in this example. Consider a marketing research project assessing consumer response to a new brand of men’s cologne. Who should be included in the target population? All men? Men who have used cologne during the last month? Men 17 or older? Should females be included, because some women buy colognes for their husbands? These and similar questions must be resolved before the target population can be appropriately defined.